Container tracking labels, for tracking inventory and work-in-process. These are typically printed with both a "license-plate" tracking barcode and human readable information such as the part number and description and the lot number of the material in the container. These are typically printed out on a barcode label printer. These are printed out of the BellHawk software through its interface to the BarTender Automation software. Product and packaging labels. These are typically printed with product specific information on a barcode label printer. They may be automatically printed and applied as part of the production line. 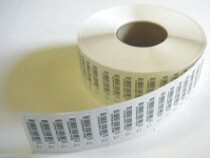 These barcodes may also be applied by inkjet printers and laser direct part marking equipment. BellHawk can interface to in-line printers and part marking equipment. Shipping labels. BellHawk can directly produce shipping labels in customer specific format through the use of BarTender Automation. BellHawk can also interface to shipping packages from UPS, FedEx and other shippers. Barcoded picking sheets for production jobs and customer orders. Also barcoded travelers that travel with batches of product through manufacturing. These are typically printed on a laser printer in the form of specialized reports directly out of BellHawk. Location barcode labels which uniquely identify locations where inventory is stored. These are attached to racks and shelves. They may also be hung over floor locations or scanned from floor posts. BellHawk sells a range of different labels, pre-printed with the location barcodes. 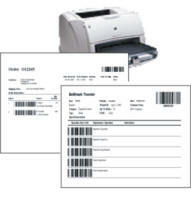 Users can also print location barcodes out on a sheet of label stock using a laser printer. Industrial tote barcodes. BellHawk Systems can provide stainless steel and ceramic barcodes that are designed to be used to identify totes, baskets and other similar containers that are subject to harsh physical, temperature and chemical environments. Employee badges with barcodes. These are used to record which employee performed which transaction. BellHawk can provide these badges, preprinted with company logo, a photo ID and a barcode containing the employee's identification numbers. Pre-printed rolls of unique barcodes. BellHawk recommends the use of these sequentially numbered labels for use as container tracking barcodes for those situations where users do not want to print out labels on a barcode printer.